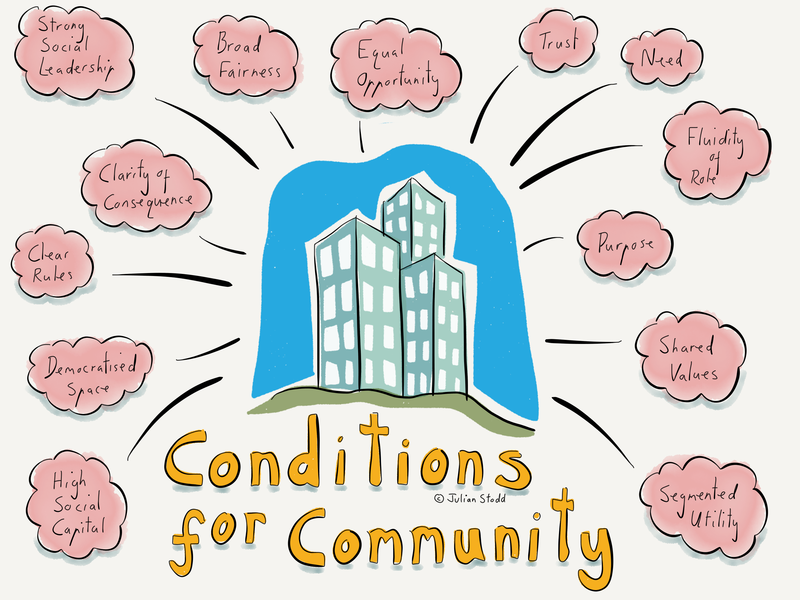 I’m working up a report on communities, specifically on the conditions for, and operation of, Communities of Practice. I’ve spend seven hours working on this on the plane today, so just sharing the introduction as part of #WorkingOutLoud. “In the Social Age, communities form the primary ‘sense making’ entity, for both leaders, and everyone else, within an organisation. It’s valuable for us to shine a light into these spaces, to build an understanding of what are, at heart, complex social structures held together with trust, respect, need, and shared interest. Specifically, ‘Communities of Practice’ can be considered as central to, and essential for, us to be effective in the dynamic and adaptive knowledge environment of the Social Age. If we can better understand the ways that people connect, and engage, to learn, and support others in their learning, and how these social structures form, and are bonded, then we can better support this process. ‘Support’ is a key word: within the formal spaces of the organisation, we can ‘own and control’ a given space, but as we venture deeper into ‘social’ and emergent communities, we will see that much of the value comes in the semi formal, or indeed totally socially moderated, spaces. And to engage in these areas, we will need to nurture, recognise, respect, and support. We will have to work within the native rules of the system: we do not get to impose rules upon it. It’s clear that learning communities are more than simply formal structures: they act at some intersection of knowledge, and the application of that knowledge, and practice, and they move beyond simple transactional terms. Communities of Practice are about people. For this reason, any guidance as to how we can better form, and utilise, Communities of Practice within an Organisational context, will inevitably have to move beyond simply looking at social collaborative technology, and formal, programmatic, approaches. This entry was posted in Community, Community of Practice and tagged Community, Community of Practice, Leadership, Learning, Social Leadership. Bookmark the permalink.